Jalal Talabani Dies: Kurdish Leader. Former Iraqi President Was 83 : Parallels As Iraq's president, Talabani was considered a unifying force who could get feuding political leaders to talk to each other. His death came days after Iraqi Kurds voted for independence. Iraqi people gather to mourn after former President Jalal Talabani's death in Irbil on Tuesday. "He used to tell me, 'I have no constitutional authority, but I have Mam Jalal authority,'" says Kamran Karadaghi, his former chief of staff. In 2003, Saddam Hussein had been toppled — not by the Kurdish fighters Talabani had led against Iraqi forces years earlier, as a young Kurdish commander, and not in a failed 1996 coup, in which the CIA had enlisted Talabani to help remove the Iraqi president, but through a full-fledged invasion. By 2005, two years after Saddam Hussein was removed, Talabani himself was in the presidential palace. It was a largely ceremonial role, one he held for nine tumultuous years while the country was wracked by sectarian war and political crisis. But Talabani used his considerable charm, bargaining skills and sheer force of will to literally bring to the table Shiite, Sunni and Kurdish leaders who otherwise refused to talk to each other. And he put his own stamp on it — refusing, for example, to sign execution warrants for prisoners sentenced to death. "Mam Jalal's presence and influence in Baghdad didn't stem from the authority of the president ... He could bring people together," Najmaldeen Karim, the Kurdish governor of Kirkuk, told me recently. 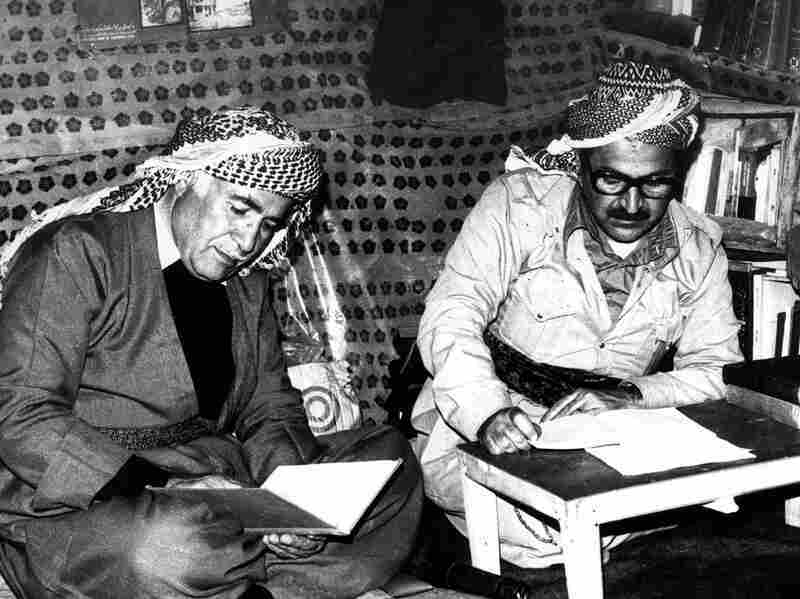 Jalal Talabani (right) sat with a fellow Peshmerga fighter in the mountains of Kurdistan in 1978. Talabani remained president — the only non-Arab ever to hold that role — until 2014, two years after suffering a stroke. He never fully recovered. In his younger years, Talabani was a Peshmerga, a Kurdish fighter who battled Iraqi forces. He founded the Patriotic Union of Kurdistan (PUK), one of the two main Kurdish political parties, in 1975. I first met Talabani in the Kurdistan region in the 1990s. My final interview with him, in 2012, for al-Jazeera English, was one of the last interviews he gave. We met at the huge, new, gleaming white political offices he optimistically had built in Irbil, on the road to Kirkuk — the disputed city that Kurds think of as a future Kurdish capitol. I asked him whether after all that struggle, the new Iraq he had worked so hard to create was what he thought it would be. "I think the collapse of the leadership was the beginning of the new Iraq — instead of the dictatorship we had, we have a democratic system ... this kind of freedom Iraqis were thirsty to have," he said. He acknowledged the country needed more security and more unity, but he seemed genuinely optimistic that this new Iraq, still in the making, would turn out to be far better than the old one. 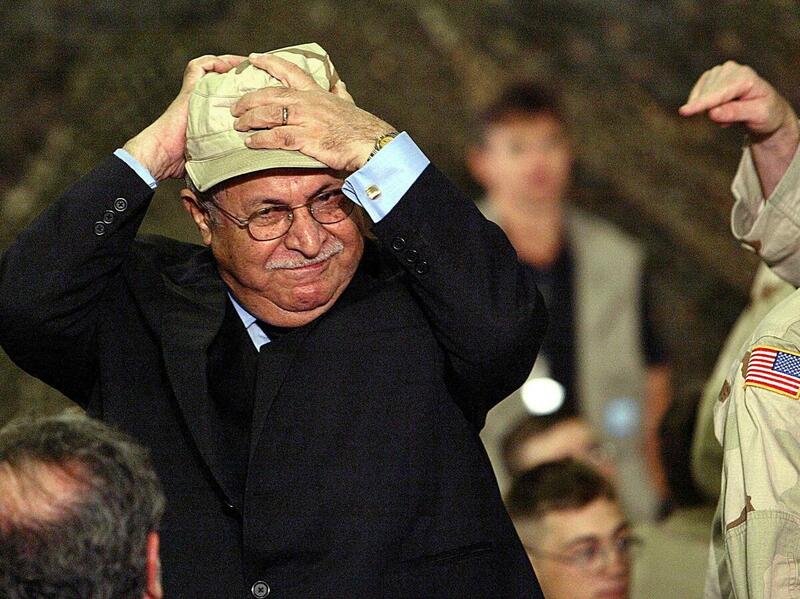 Before President George W. Bush arrived for a surprise visit to Baghdad in November 2003, Talabani put on a U.S. Army cap. For some, including the Kurds, it was in fact much better. Their history in Iraq included Saddam's 1988 Anfal campaign, which killed more than 100,000 Kurds and destroyed thousands of villages. Thousands of civilians were killed with chemical weapons in Hallabjah. After the U.S. drove Saddam's forces out of neighboring Kuwait during the first Gulf War in 1991, Kurds rose up against the Iraqi government. Along with Shiites in the south, the Kurds were encouraged by the United States. The U.S. never came up with the air cover Talabani said it promised, and Saddam's forces moved in, while hundreds of thousands of Kurds tried to flee over the mountains in winter. To stop Iraqi planes from further attacking the Kurds, the U.S., Britain and France established a no-fly zone. It was a decision that allowed the Kurds to break away from Iraqi control and build a region beyond the reach of Saddam's forces, but Baghdad punished the Kurds by cutting off trade and fuel. The Kurdistan region also was included in a crippling U.N. embargo against Iraq. When I met Talabani in the 1990s — against the backdrop of a Kurdistan region largely ignored internationally and suffering from this double embargo — he optimistically was planning for the next revolution. With no electricity, the Kurdistan region then was dark, its cold nights marked by the ever-present smell of kerosene heaters. 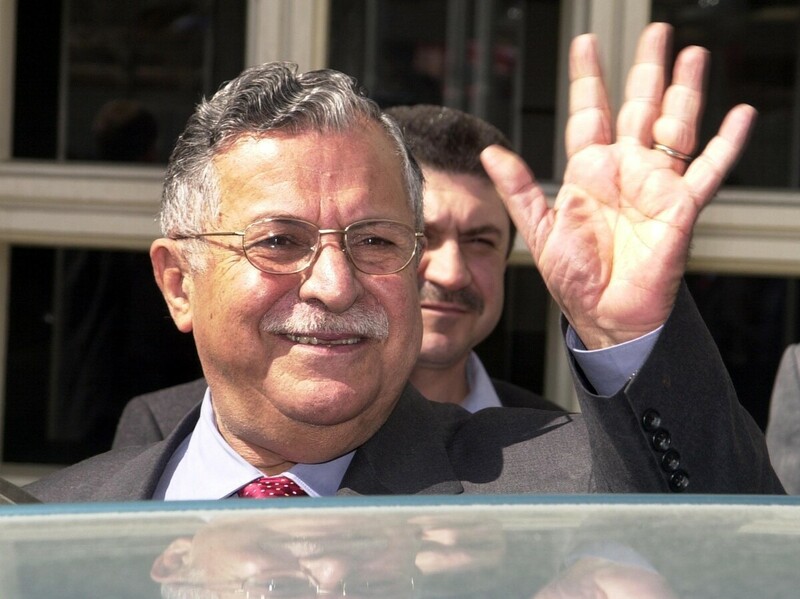 Jalal Talabani, shown here in 2003 in Istanbul, died Tuesday in Germany at age 83. After the war, when I saw Talabani in Baghdad, he was ensconced in Saddam Hussein's old Aladdin-like palace on the Tigris River. Iraqi political leaders, summoned or cajoled into coming to one of Talabani's reconciliation meetings, walked up the red carpet on the marble stairs. Talabani was often the glue that kept Baghdad from falling even deeper into crisis. Talabani's Role in Iraq: Mr. Big? After he stepped down, "You haven't had a meaningful meeting between the parties — Sunnis, Shiites, even in Kurdistan," says Karim, the Kurdish governor of Kirkuk. "The turmoil that we have between the political parties is [a function of] his absence on the political scene." In 2012, the Kurdistan region was more prosperous and more powerful than it ever had been. I asked Talabani what was next. "The next step is to strengthen democracy in Iraq and build infrastructure of our society and develop the society as much as possible," he said. "We must be very frank with you — not only is independence not possible, but also now it is in the interests of the Iraqi people to remain in the framework of Iraq." He said that, for his legacy, "I would be glad if they say I struggled for democracy, for Iraq and for Kurdish rights." Talabani fell ill before the bitterness between the Kurdish region and Baghdad deepened, before Brexit, before Catalonia, before the Kurdish referendum for independence two weeks ago that was pushed through by Kurdish President Masoud Barzani. Talabani was dying in a German hospital when Kurds went to the polls last week to vote in support for independence. It's difficult to know what he would have thought. "I think he would have had a very serious discussion with Kak Masoud [Barzani] about the referendum," says Karadaghi, Talabani's former chief of staff. "He always managed to solve problems by talking directly with Kak Masoud. They were very close." He and Barzani, the Kurdish president who heads the Kurdistan Democratic Party that Talabani broke away from, reconciled after fighting a civil war against each other for almost a decade. Two weeks ago, before the referendum, Barzani paid a rare visit to Suleimaniya, Talabani's stronghold. He told a rally that the quest for self-determination would have been easier if Talabani had been in better health. Instead of Mam Jalal's jovial, familiar presence, Talabani's wife Hero Ibrahim Ahmed, herself a PUK leader, sat in his place. 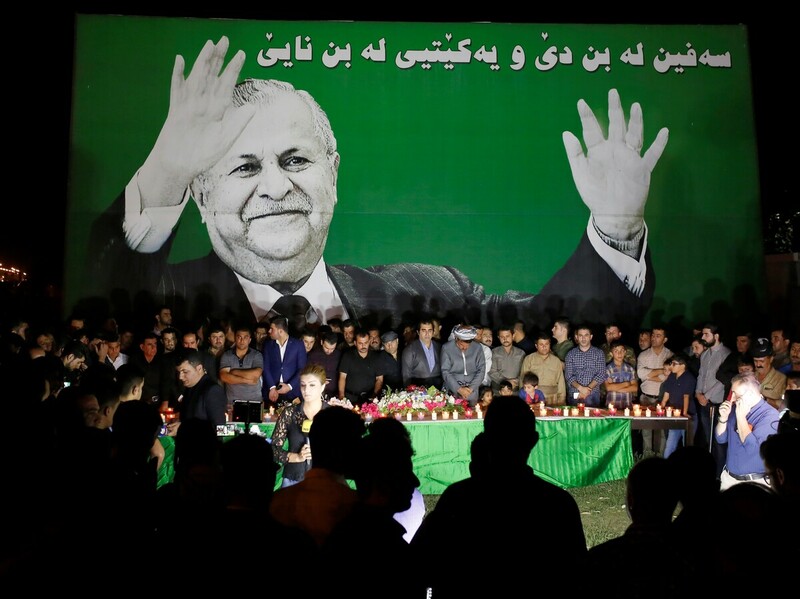 As news broke of Talabani's death, many Kurds wept and lit candles next to the larger-than-life photos of the beaming and waving former president. His body will be brought back from Berlin, where he died, to be buried in the Kurdistan region. But many the multitude of foreign officials, friends and comrades-in-arms wanting to pay their respects to postwar Iraq's longest-serving president will have to wait: In retaliation for the Kurdish independence vote last week, the Iraqi government has shut down all commercial flights to the Kurdistan region.